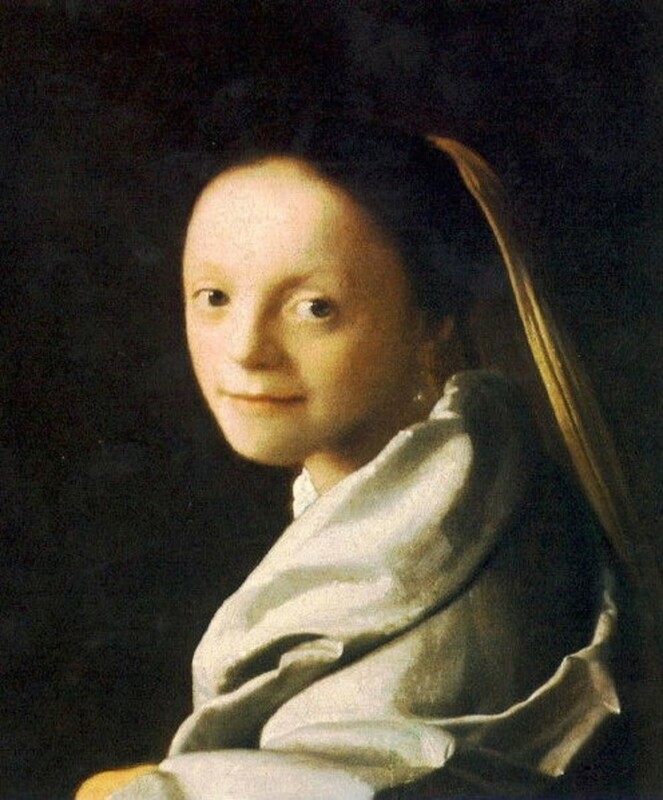 Vermeer is a rather mysterious artist. We have no portraits to tell us what he looked like. Even the facts of his life are few. We do know that he left only thirty-five paintings, and his creation of a few of them is still disputed. 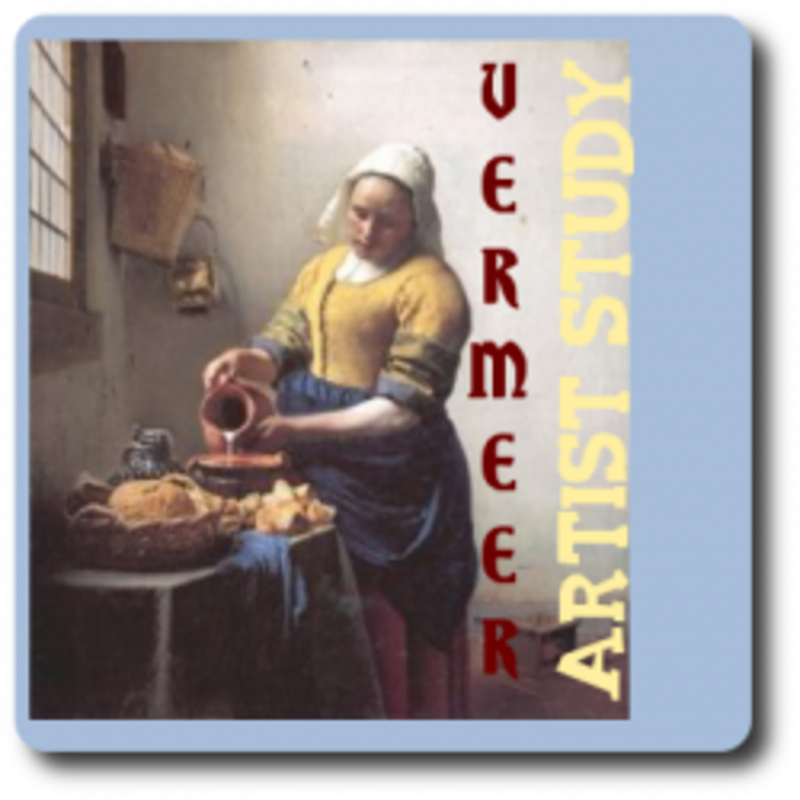 With little background information on his life and just a few dozen paintings, Vermeer makes a great artist for a Charlotte Mason styled artist study because there are no lengthy biographies to distract us from enjoying his art. Just dive in and enjoy his paintings. That's what a CM artist study is all about -- studying one artist in depth for an entire term by narrating paintings, one at a time. 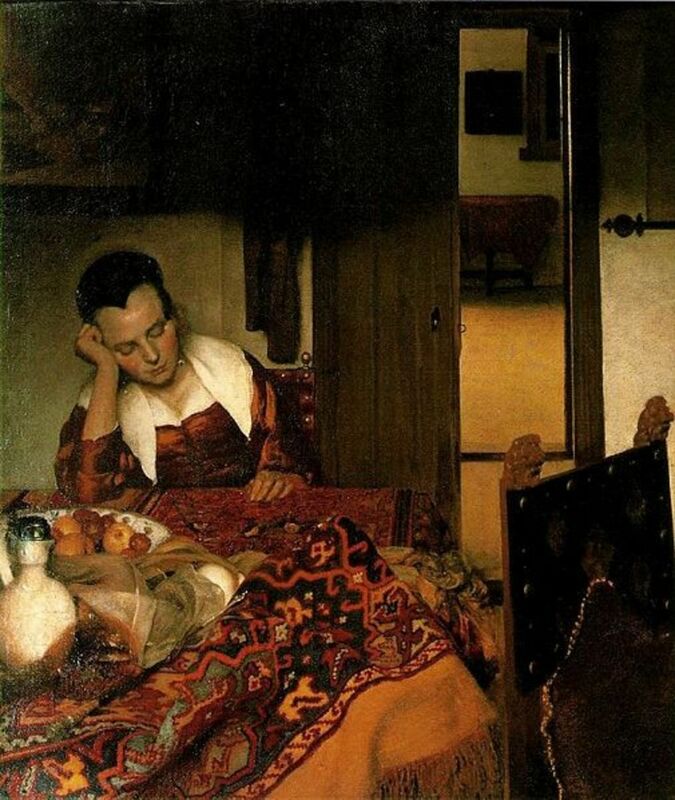 The idea is that after looking at so many paintings by Vermeer, you will instantly be able to spot a Vermeer because you've internalized his style. 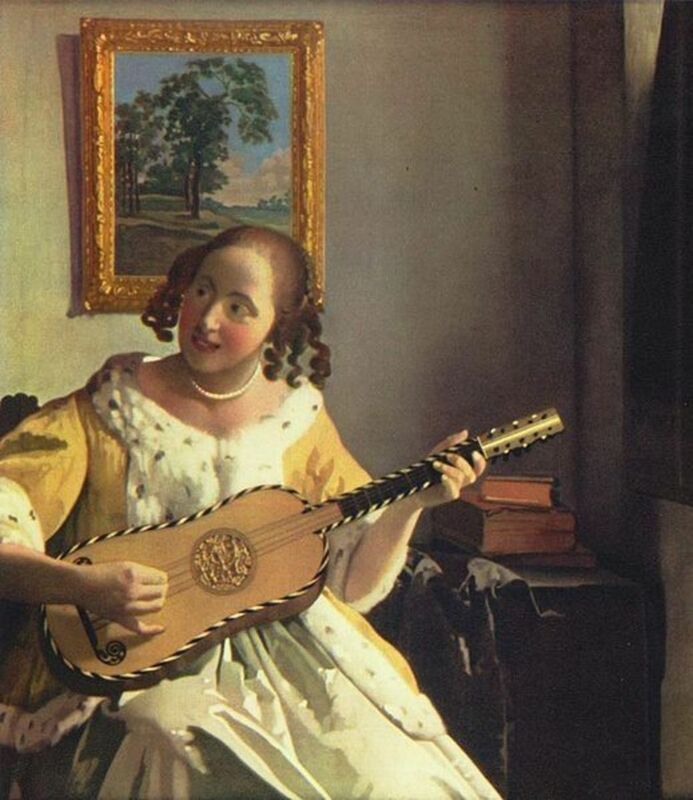 Actually, for Vermeer, this is quite easy to do. His recurring themes and distinctive single style make his work easy to point out. If you've chosen Jan Vermeer to be your artist of the term, your first concern it to select paintings and have them on hand in some format. I prefer a book to hold. But many people download images from the Internet for a totally free artist study. You can use the 12 paintings cycling in the slideshow above. They are also at a Flickr set. I downloaded them all from Wikipedia public domain, so you can also download them. Click on the button titled ALL SIZES above a photo to download it. Mrs. Happy Housewife's Flickr set of Vermeer paintings. This is my favorite site for finding art images. Click on the thumbnail for a larger size image. Although this won't do for your actual picture study, this resource may serve as a nice reference or something for an art notebook. 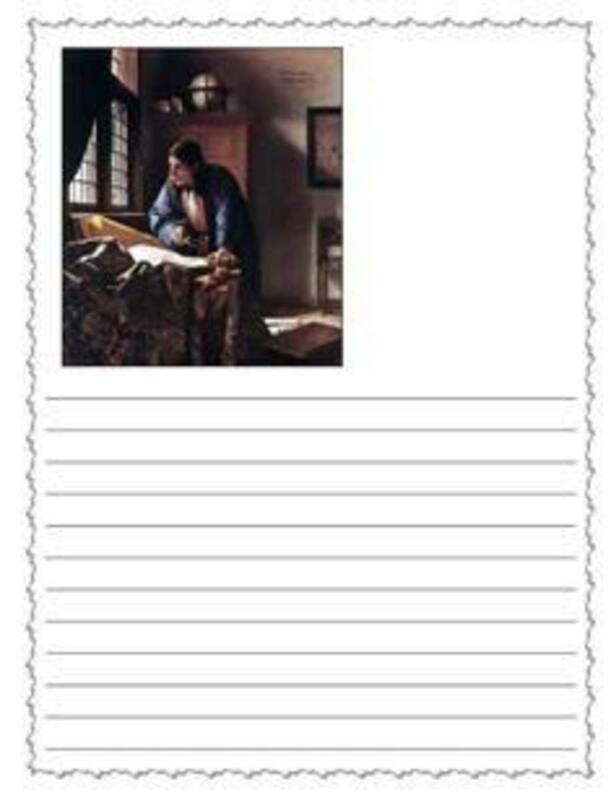 Klaus Nordby's site has a free printable poster with 12 thumbnails of Vermeer's art . He also has a free poster with all 35 of Vermeer's paintings. Now that you've got your painting chosen, you can begin your picture studies. 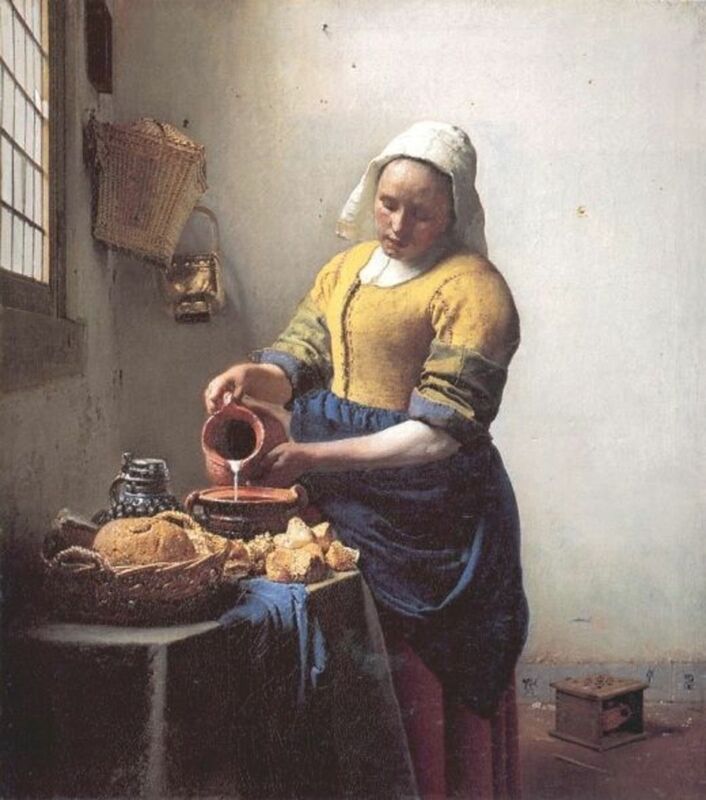 A great activity to work on as you study Vermeer's art is to look for themes. 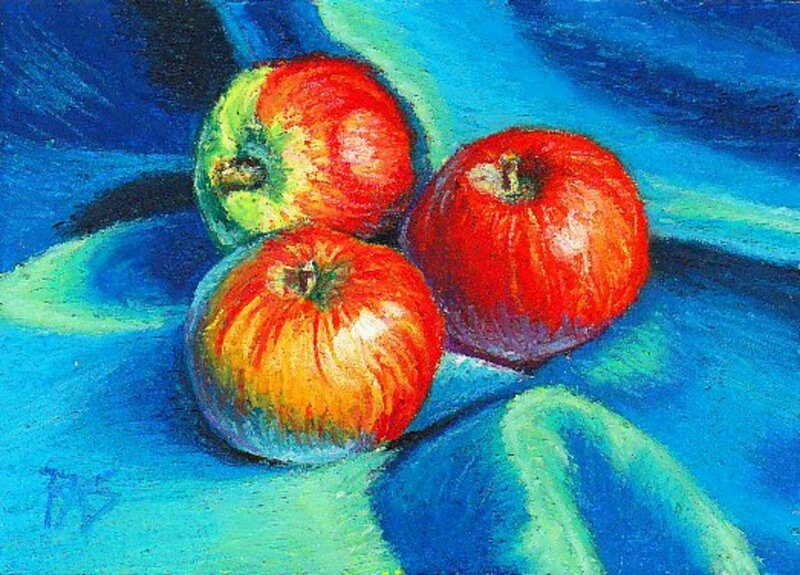 With only 35 paintings, they are easy to spot -- ladies, windows, tapestry table coverings, bowls of fruit, pearls, daily life. You can even find the same tapestry or same chair or window used in many paintings. Your children will have fun spotting the similarities and wondering why they are there. Have fun with it! 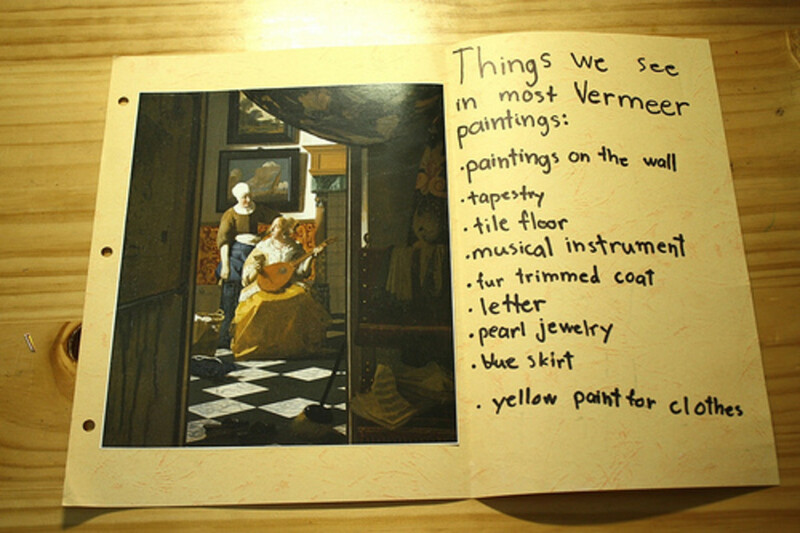 Let your children treat the study of Vermeer as something of a scavenger hunt to find how many reoccurring objects they can spot. 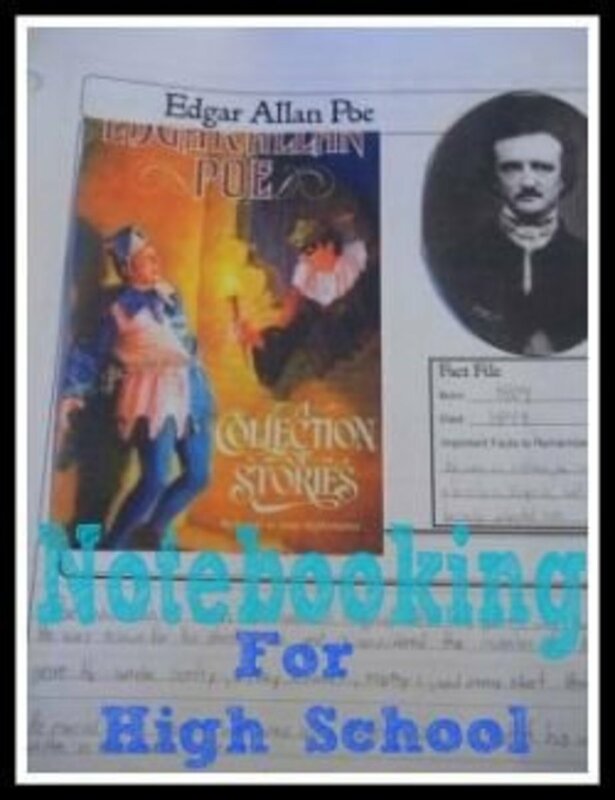 The notebooking page below is an example. 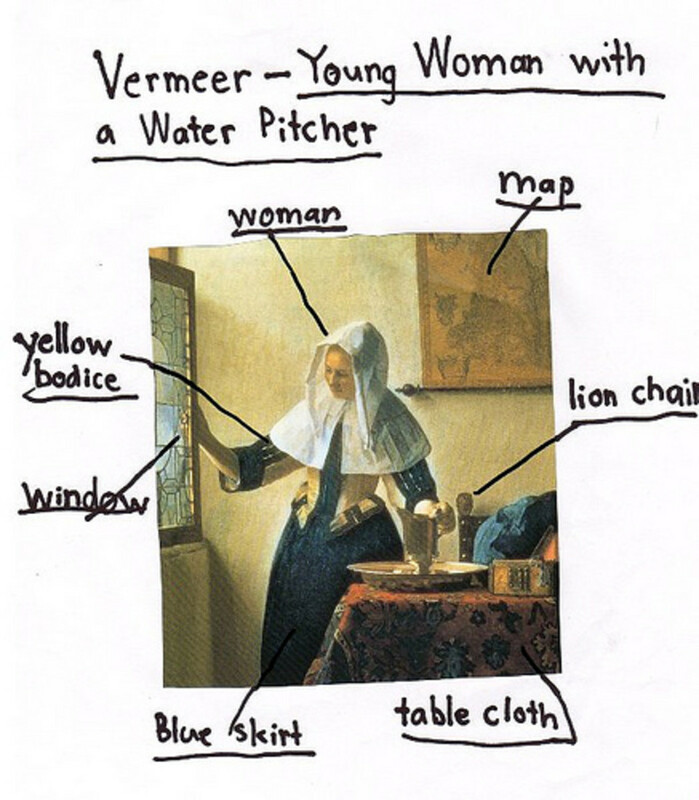 About midway through our study of Vermeer, I gave my daughter "Sprite" a new painting and asked her to mark on it all the elements we've seen in other Vermeer paintings. She found quite a few! Sprite enjoyed this activity so much that we did it again with another painting. And later we chose two similar painting to compare and contrast. Notice the use of the Venn diagram on this large, fold-out notebooking page. If mom or older children want more context into Vermeer's life and times, here are two good resources. 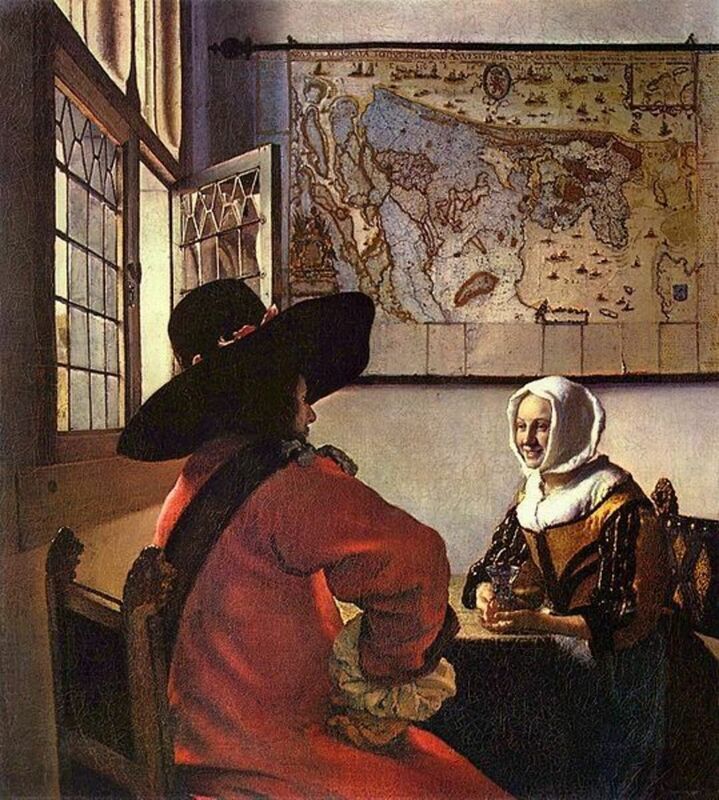 For background information, a complete list of paintings, and so much more visit Essential Vermeer. For a broader view of Dutch seventeenth century art, see the National Gallery of Art. 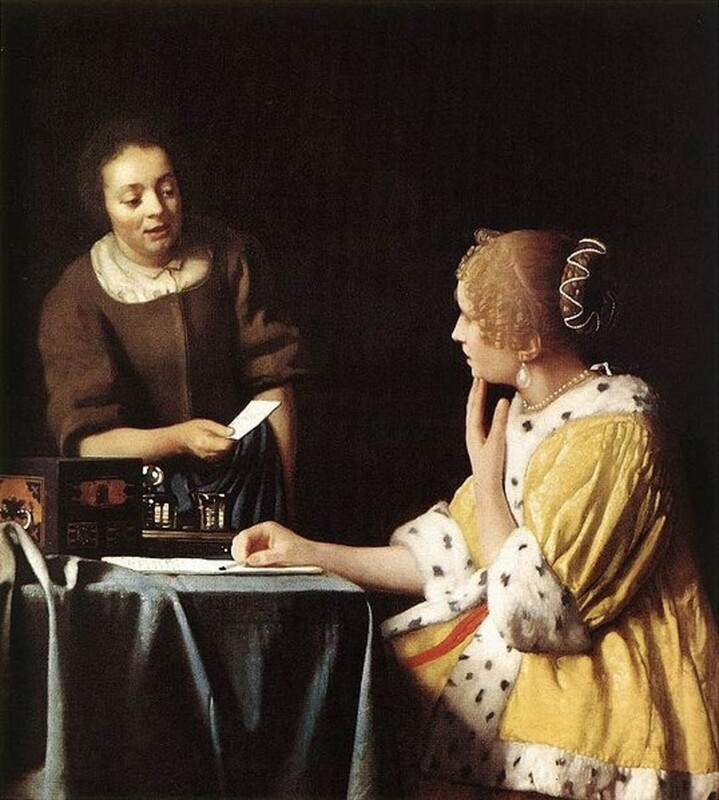 There's a free PDF -- Painting in the Dutch Golden Age: A Profile of the Seventeenth Century. This is actually an entire 164-page book that provides lots of details about Dutch art during Vermeer's time. 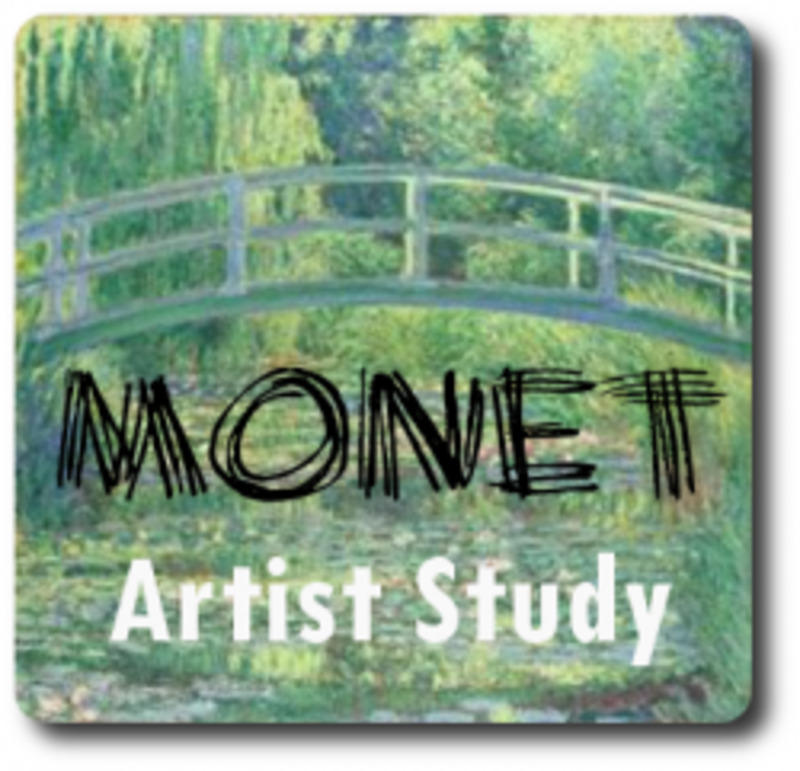 Chapters look at landscape, still life, portraiture,and history painting. Also included are artist biographies including Rembrandt, Vermeer, and Frans Hals. Although not a necessity for artist study, we like to try our hand at reproducing one painting from each artist we study. Here is Sprite's version of The Guitar Player. She sketched in pencil and then added colored pencils over that. 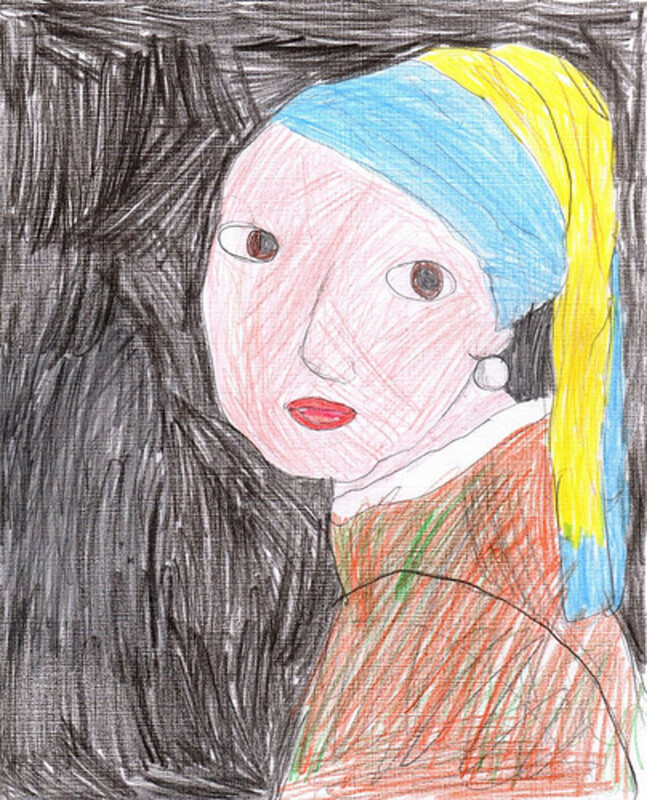 Here is her version of Girl with the Pearl Earring, probably Vermeer's most famous work of art. Another option is to use the coloring pages linked below as a base for your own reproduction or notebooking page. At $10 per book, these are a good bargain --much cheaper than printer ink to print 10-12 paintings. Black and white coloring page. This is a more true to life outline. A printable outline suitable for coloring. A very detailed coloring page. 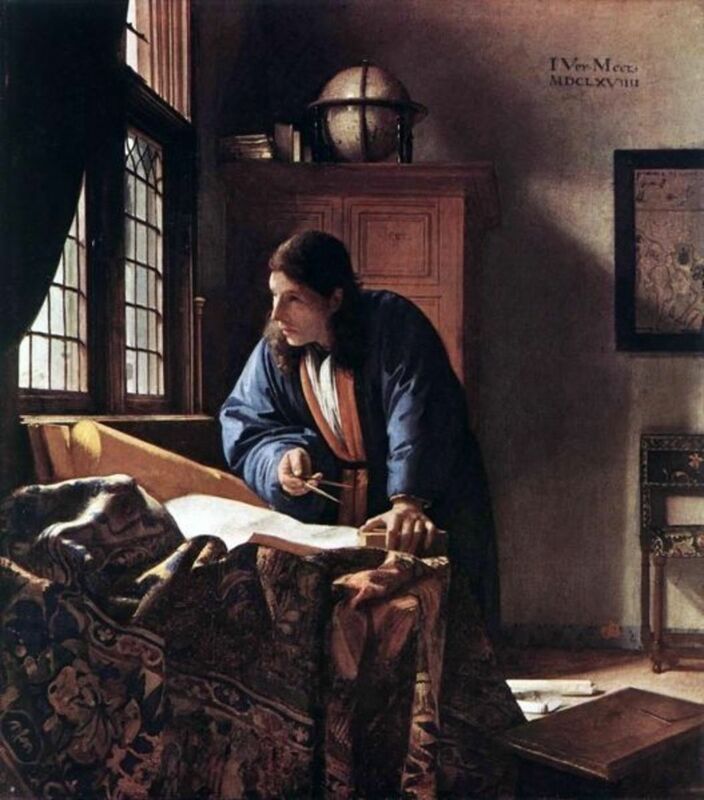 A crossword and a word search with a Vermeer theme can be found here among her Vermeer material. Add a fictionalized mystery to the mix! Read a review of this book at An Organized Mess. This book mixes math, art, and logical thinking into a suspenseful mystery. We read this book alongside our Vermeer artist study, and my daughter and I both liked it. It is very suspenseful and grabs your attention in a plot full of twists and turns. I love how math and art are woven into the book. Balliett, the author, has a degree in art history, so the art facts are all correct. A word of caution If you object to stories with magic, avoid this book. Although there is not outright magic in the book, there are supernatural elements and unexplained events. Calder, the male protagonist, is constantly pulling pentominoes out of his pocket and assigning meaning to them as if they are omens. I considered his behavior simply the active imagination of a creative boy. Much more troubling was the painting that somehow somehow "speaks" to Petra, the female protagonist. 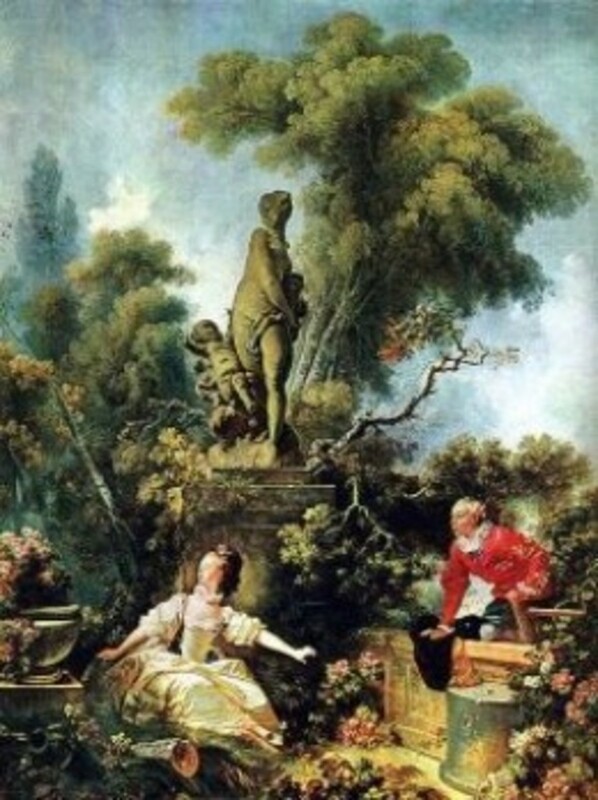 And at the end, when the mystery is solved, the explanation for all the strange coincidences of the plot is that the painting itself somehow arranged it all. We suspended disbelief and just enjoyed the story despite the absurd explanation. It was a good teachable moment to discuss how God ordains the events of our world and how He can speak to us through the events in our life. If you do read the book, be sure to use this pentominoes printable. And visit Blue Balliett's section at Scholastic for online games and information about both the author and the illustrator. I designed two sets -- one in landscape orientation and one in portrait. Each set features two paintings -- The Geographer and The Milkmaid, both with a full color and a black and white line drawing. A total of 7 pages in this set. This set has 6 pages. 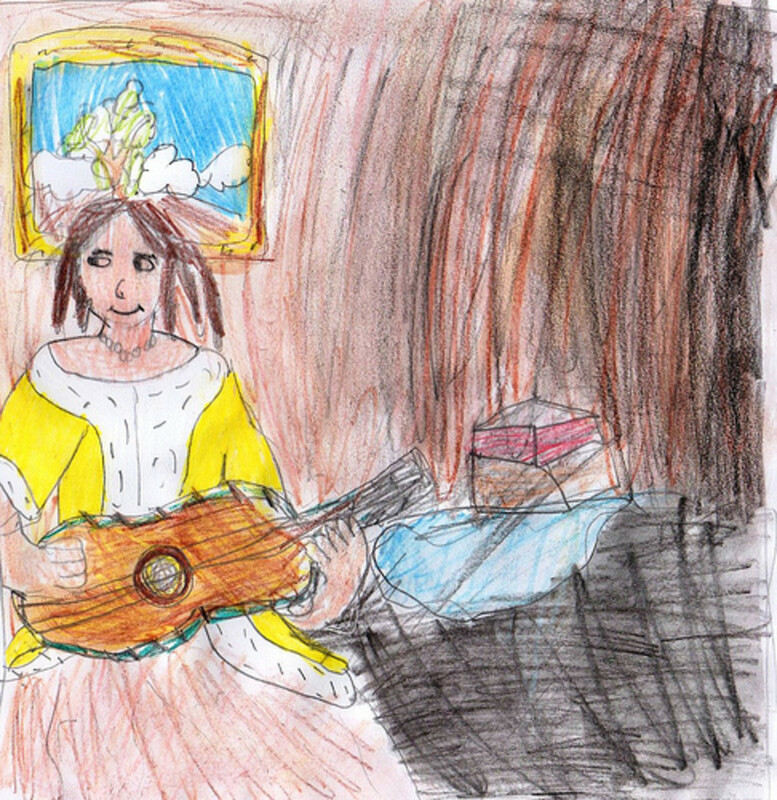 These freebies, created by a generous homeschooling mom, include many artists of which Vermeer is one. 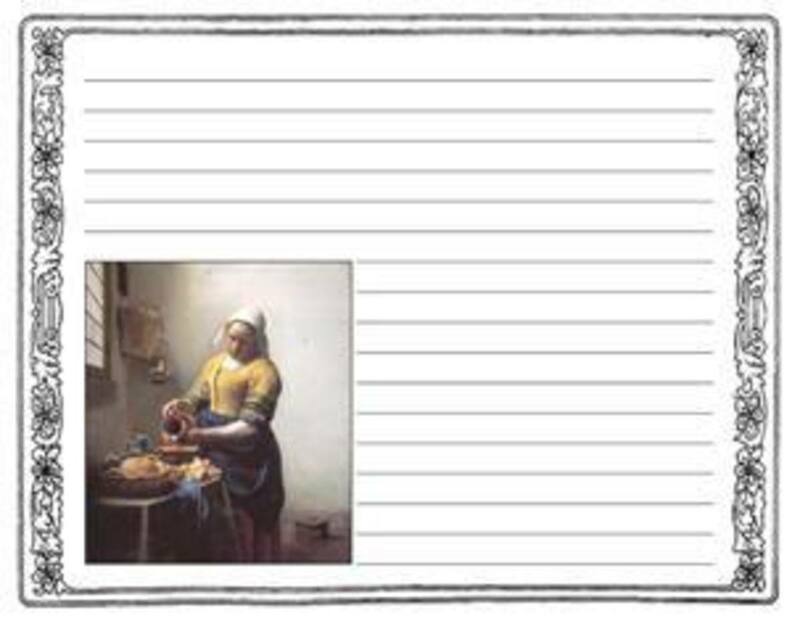 Also visit her free printable minibooks PDF that also has a section on Vermeer. 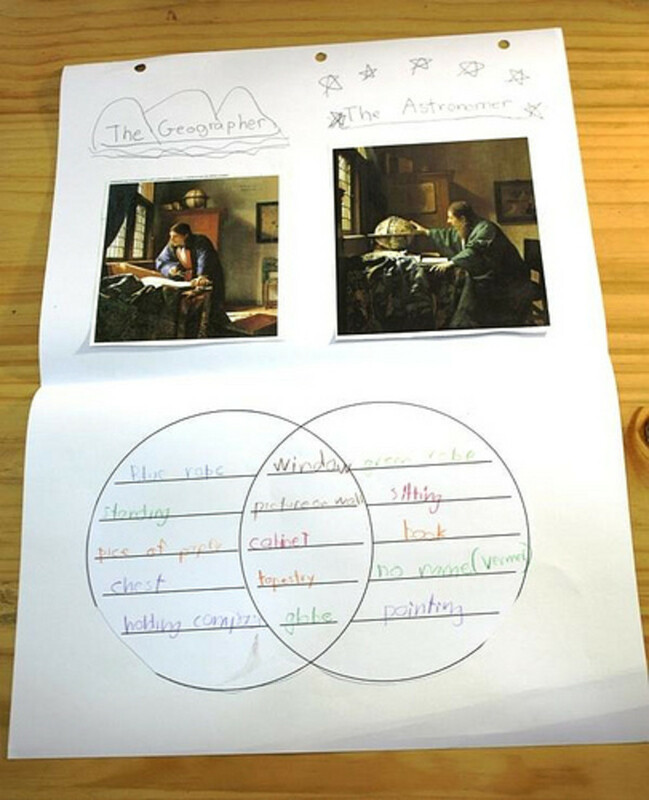 This meaty, 2 page PDF is described as a guide to give classroom teachers a comprehensive understanding of the artist and artwork. 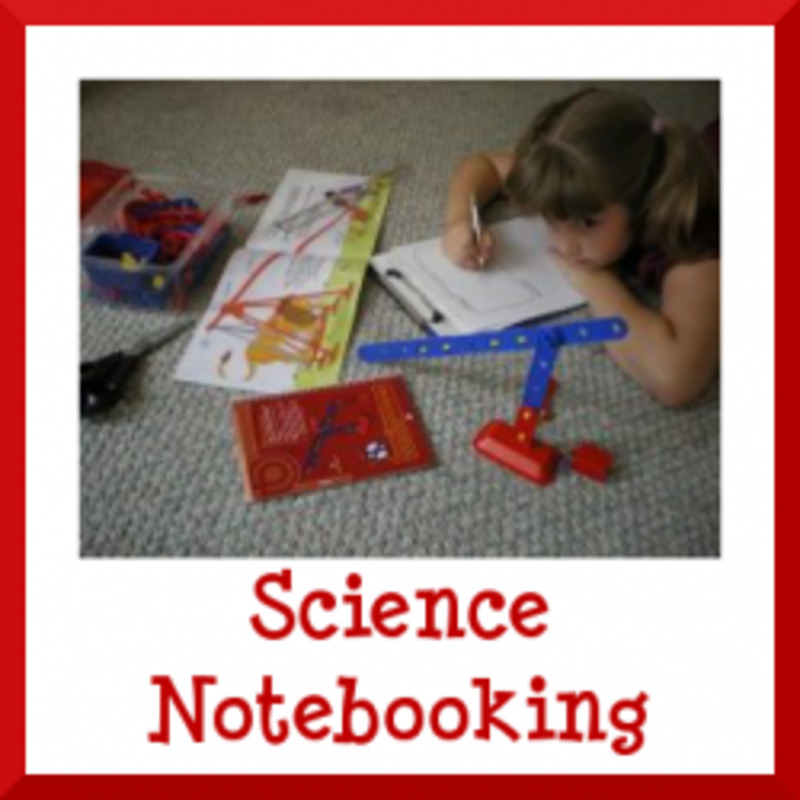 Helpful activity and discussion ideas. 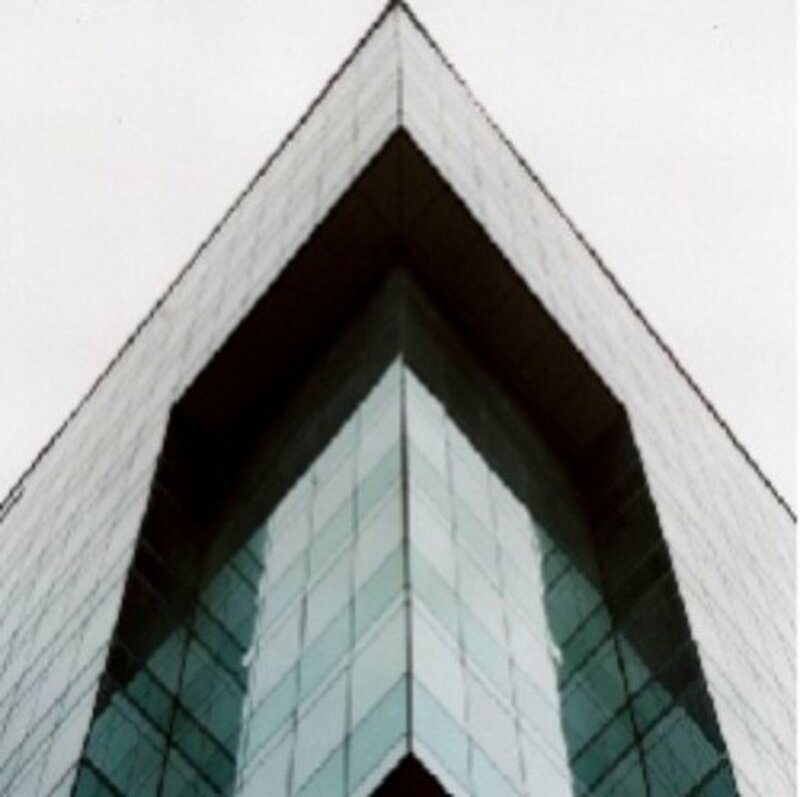 the colored pencil drawing is beautiful.have you ever heard of abstract.i typed in artist on google search to view the best.this pic stood out of thousands before my eyes.just when you think you've seen it all, look again. This is a wonderful collection of resources. 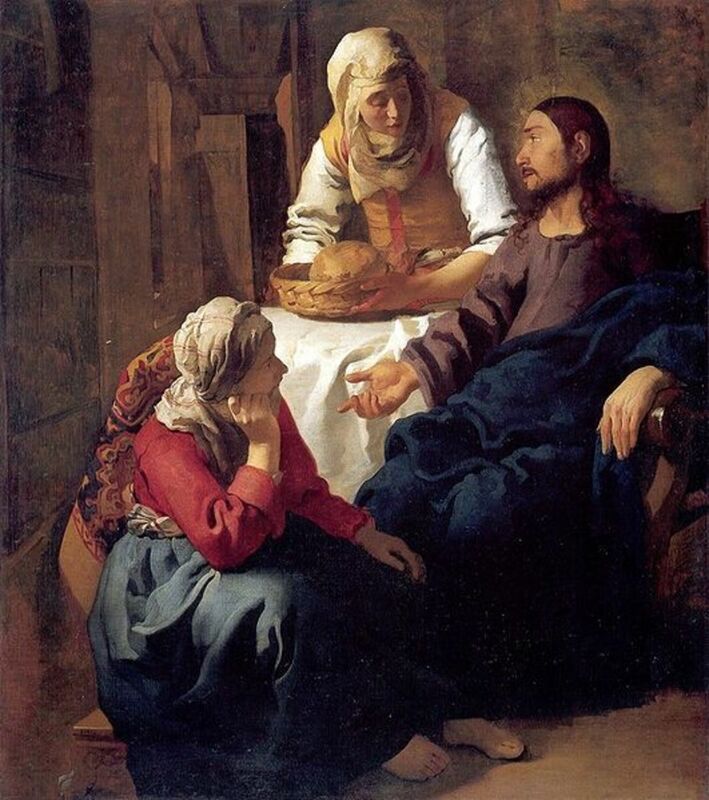 Vermeer is one of my all time favorite artists to study. Thank you so much. Another great artist lens! Thanks for putting these together! Thank you! I have come across your site a few times as I plan art lessons. You always have very good ideas and the information is thorough. I am a huge Vermeer fan - thank you for this great lens. Not a big Vermeer fan, but your lens about him held my attention. Very good. I had to pop around and look at some others. I love how you included the kid's artwork in the lens. Really nicely done. 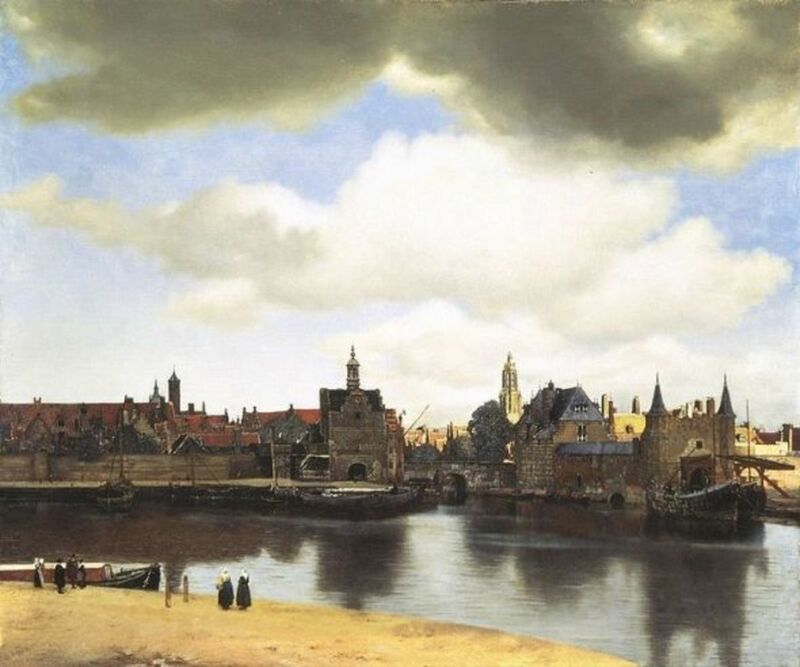 This is a great source of information on Vermeer. Thank you for putting it together and I really enjoyed seeing Sprite's artwork. I favorited this lens and lensrolled it too. One of my favorite artists. 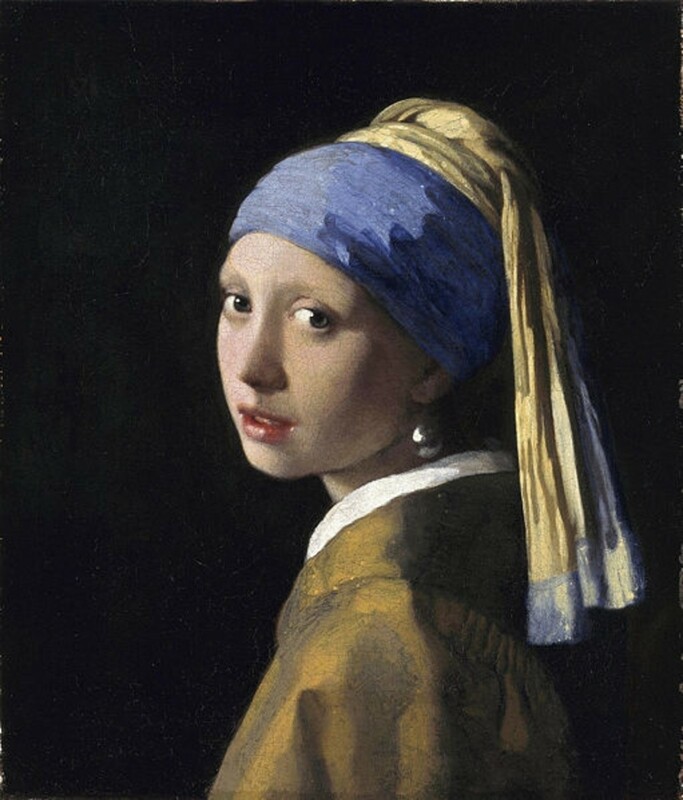 I have "go see Girl With A Pearl Earring in person" on my bucket list. This lens reminds me of a book I read--a fictional account of a Vermeer painting, how it changed hands over the years I believe. I think the author was Susan Vreeland. Now, what was that called? I'll have to go look, because I'd love to read that again. Anyhow, I love the lens and those sketches too! Thanks for including me in this! I agree with your opinions on Chasing Vermeer. I also think it gives us as Christians an opportunity to discuss and practice discernment. There are things out there that we cannot just simply avoid because we deem them "bad'. We must use our faith to explain why they are unacceptable. When my oldest read the Harry Potter series, I had write an essay on at least five things or themes in the books that were in contradiction to our faith and why.